Now, I’ll be the first to admit, as much as I love the Isle of Portland, in all honesty I don’t know a great deal about it’s history, for that I defer to local historian and accomplished author, Stuart Morris. What I do enjoy is reading through the old newspapers and uncovering stories of the everyday person as they went about their daily lives, their jobs and homes, their loves and dreams, their celebrations and their downfalls. I was recently asked to do some research on the history of a public house in Castletown, so hubby and I went for a drive over to take a few snaps of the area. It’s been many years since I had walked down this road on my annual pilgrimage to the good old Portland Navy days, when thousands of people would stream along here heading for those imposing Naval dock gates. As a small child I can recall looking up into the windows of shops filled with uniforms covered in gold braid and button…it spoke to me of princes and heroes. To those that don’t know the area, (and those who didn’t twig, like myself, until I started researching this) Castletown is so named because…well, because of a castle. Portland castle to be precise. 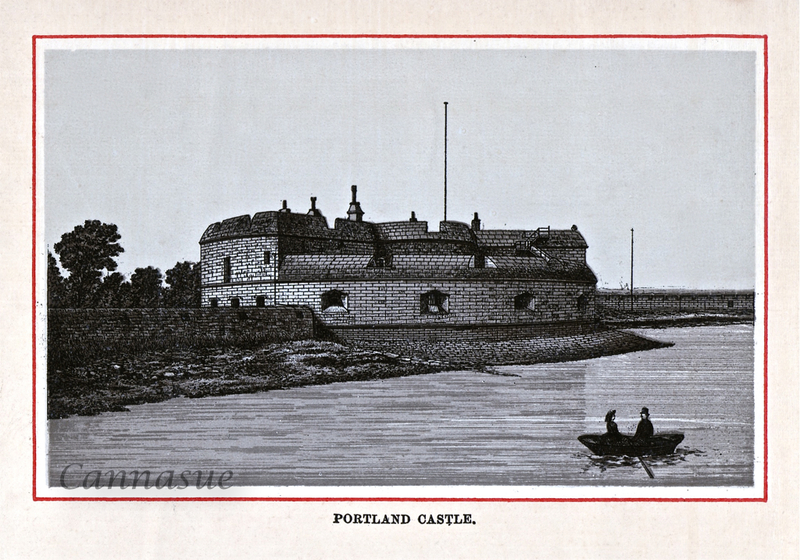 A Henrician fort built during the reign of Henry VIII to protect his mighty naval fleet whilst in the confines of Portland Roads. 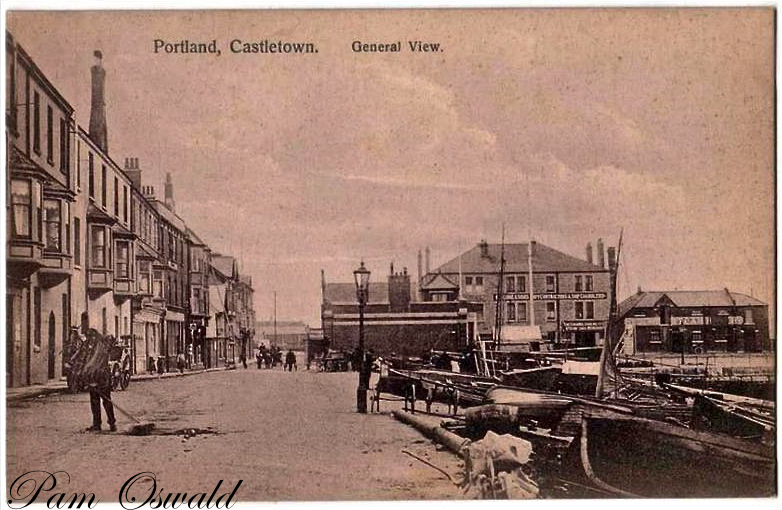 Castletown started out as a small fishing village, its little sheltered beach tucked within the lee of the great cliffs behind saw the arrival and departure of many a local fisherman and indeed more than a few canny smugglers. Others who would land here were the naval men or merchant seamen whose boats were moored out in the safety of the Roads. 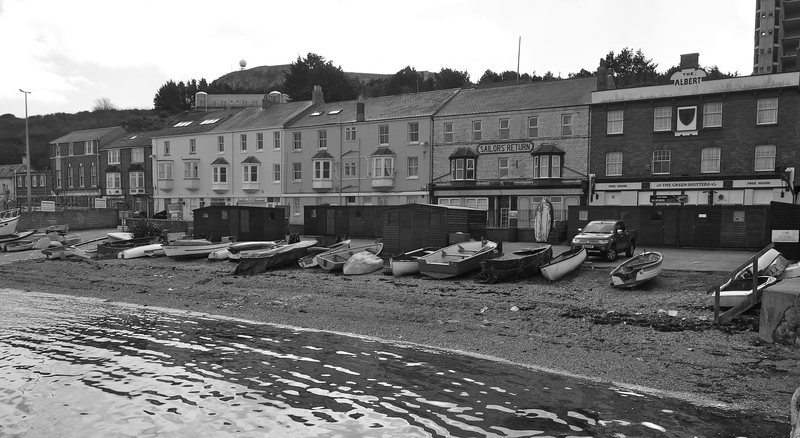 In fact, one of the first public houses to be built along this stretch facing the beach was rather aptly named The Jolly Sailor, which was opened in 1775. Over the following years this small but bustling through fare, positively alive with visiting Jack Tars, became a one stop destination for those going or arriving. 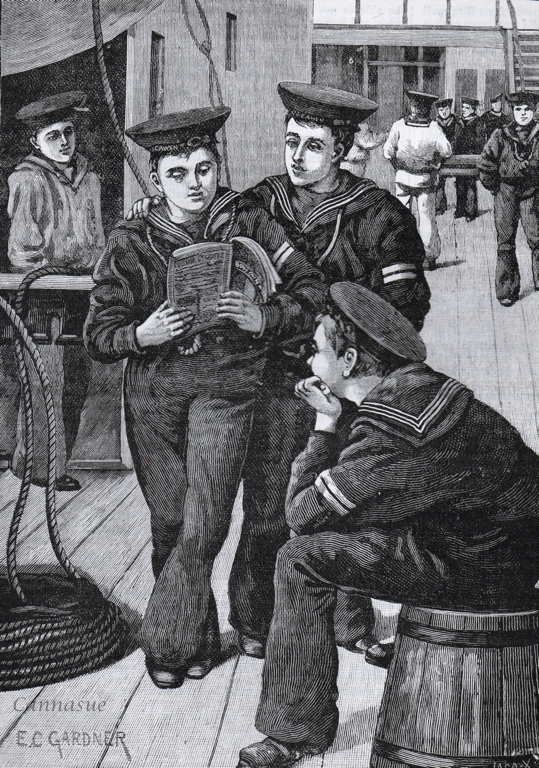 Shops and businesses began to appear along the road and piers, catering to their every need, and the things that the majority of shore bound sailors certainly needed was clothing, uniforms, shoes and boots, and alcohol …..lots and lots of it! So much so that poor old Castletown became synonymous for drunkenness and bawdy behaviour. 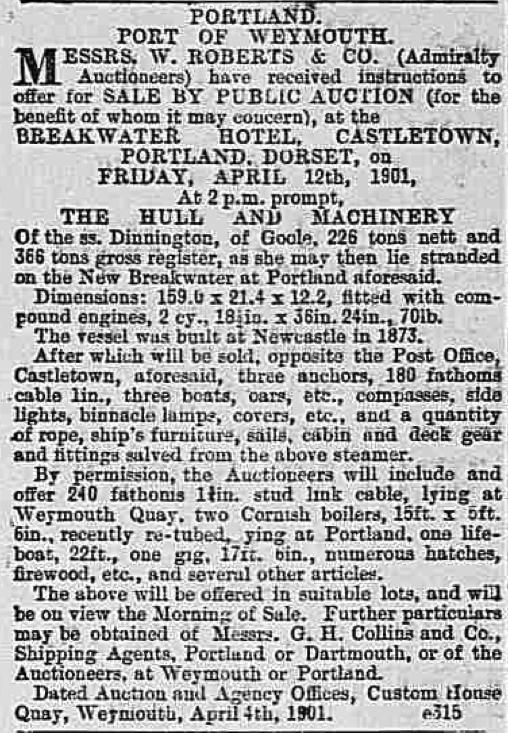 Come the mid 19th c and the fortunes of Castletown positively boomed. Monumental works were ongoing on Portland for the construction of the mighty Verne Citadel, the accompanying breakwaters and Nothe fort over in Weymouth. Royal Engineers, civilians and convicts worked side by side moving innumerable tons of stone, this grand scheme was a great tribute to Victorian engineering. Much of this work took place in and through Castletown including the start of the long arms that wrapped protectively around Portland Roads. Of course, such wondrous sights were not to be missed, and Victorian sightseers flocked to the area literally in their thousands. Every day packed vessels drew alongside the piers and disgorged hoards of inquisitive trippers ashore, they all needed refreshments and trinkets to buy, much like todays tourists. According to The Post Office Directory of Dorsetshire by 1855 this small street in Castletown could boast 4 hostelries where the thirst of these intrepid trippers and visiting naval men could be quenched. There was even an imposing newly built hotel, the majestic Royal Breakwater, which faced the beach. A very grand building where those of a certain class who wished to avail themselves of its accommodation could sit in comfort and relax, watching the frantic activity ongoing along the shoreline. However, for this particular post I shall concentrate on Castletown at the turn of the century, when through the demise of the ageing Queen, the Victorian became the Edwardian era. 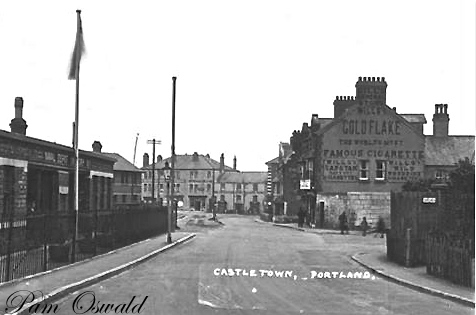 It’s 1901 and as we approach the start of the main road of Castletown, we arrive at the shop at no.25. This is the business of 37-year-old Eli Gill and his wife, Laura. Eli runs his own busy boot and shoe repair business. His wife Laura is kept pretty active too, besides looking after their three lively young boys, Harold, Reginald and Leonard, she presides over her bustling refreshment room, this she does with help in the form of a live in servant, 17-year-old Emily Foot, a Lychet Minster girl who moved here as a mothers help. Eli’s father already owned and ran a boot and shoe shop here as early as the 1870’s, shown by this report in the Taunton Courier and Western Advisor of 1877. Next door to the business of the Gills is oldest pub in the street, The Jolly Sailor, a thriving hostelry, (sadly no longer!) that more often than not lives up to its name. At the turn of the century, Robert William Winter Male and his wife Sarah are mine hosts, both are from local families. In fact the the lively bar rooms and the comings and goings of the guests at the Jolly Sailor had pretty much been Robert’s life, for over 20 years it had originally been run by his Dad and Mum, Arthur and Sarah Ann. Now Robert and Sarah run the pub, they have a young family of their own, baby girls, Olive, Irene and new born baby Joy. As up and coming people of means, they too employ a young girl in to help with their growing family and serve behind the bar, in 1901 it was 19-year-old Bessie, a Portland lassie. Also in the hostelry at the time of the 1901 census were three boarders, as you might expect, transient Jack Tars of course. 1901 also sees the arrival of the Reserve Squadron, it heralds a hectic time for all those living and working in Castletown. One house along from the Jolly Sailor is no.23 and here we find the Anthony family, Mum and Dad, John and Annie, and a trio of offspring, John, Elizabeth. and Reginald, all born in Weymouth. The Anthony’s run a successful boat building firm. Their youngest son, Reginald Edward, born in 1889, is a boy of the sea, he works alongside his father in the family business. The chappie living next door at no. 22, is 48-year-old Alfred Thomas Hounsell, also a boat builder. Alfred and his second, (possibly 3rd!) wife, Lydia, are Kimberlins, (not Portland born and bred.) Alfred hails from further along the Dorset coastline, Bridport, whereas Lydia moved from across the water, a Channel Islands girl. Alfred had lost his previous wife Julia (nee Comben) a few years earlier in 1897, but hope springs eternal and cupid gave him another shot at love. 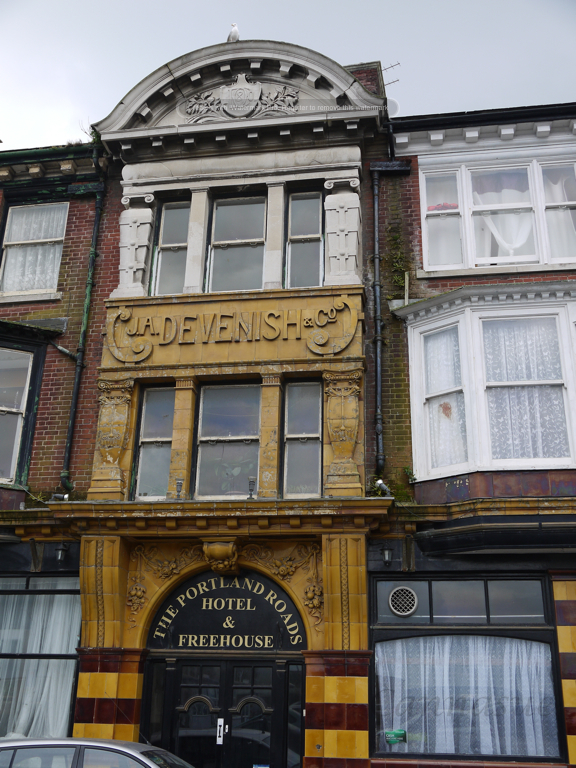 The Hounsell’s neighbours, also incomers to the island, are Alfred Coombs and his wife, Beatrice, they run the bustling Portland Roads Inn with it’s beautiful and ornately decorated tiled entrance. Alfred’s family originates from Swyre, he is a carpenter, but knows the licensed trade well being the son of an inn keeper, his father runs the Bull at Swyre. It’s not hard to work out where his wife, 31-year-old Beatrice hails from, her thick brogue sharp tongue and quick wit reveals her place of birth, Ireland. They too have a young son, 5-year-old Alfred Bertram, and an inn full of guests on the night of the census, mainly transient sailors and soldiers. Next comes the Royal Breakwater Hotel which takes pride of place in this road. In 1901 it is being run by feisty widow, 58-year-old Jane George, who is from Child Okeford, Dorset. Jane had been running the hotel along with her husband, Edward, but 4 years earlier Edward passed away and it was left to Jane to carry on single handed. Before they moved to Portland the couple managed a successful building business in Milton Abbas for many years, but by 1895 the family had arrived on the island and taken over the lucrative Breakwater Hotel. 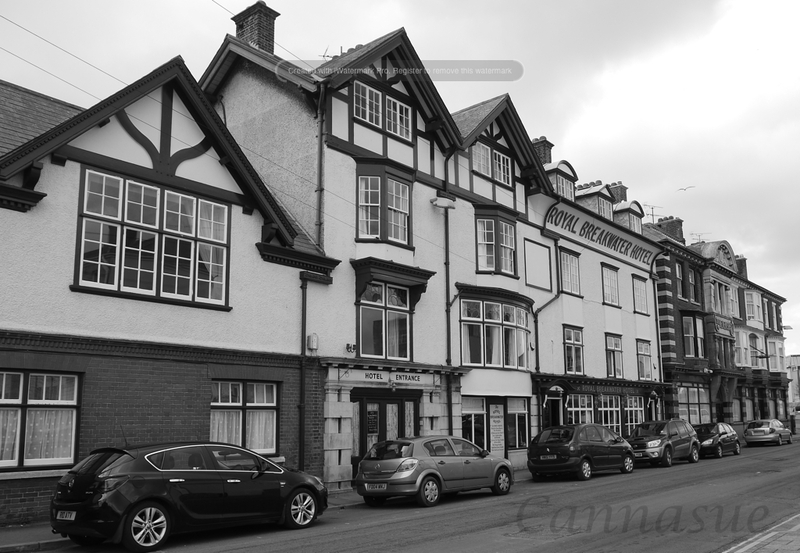 Working alongside their mother in the family run hotel are daughters Gertrude May aged 25, Mabel Louisa aged 18 and one of her married daughters, Helen Louise who is living there with her husband, Frederick Albert Trace. Frederick works as a naval school master, maybe he is employed on the Boscowen naval training ship based in Portland Roads, preparing the next generation of sailors for a life at sea. Their hotel is bursting at the seams on census night, mainly occupied by transient men of the sea with a couple of visiting soldiers thrown in for good measure. 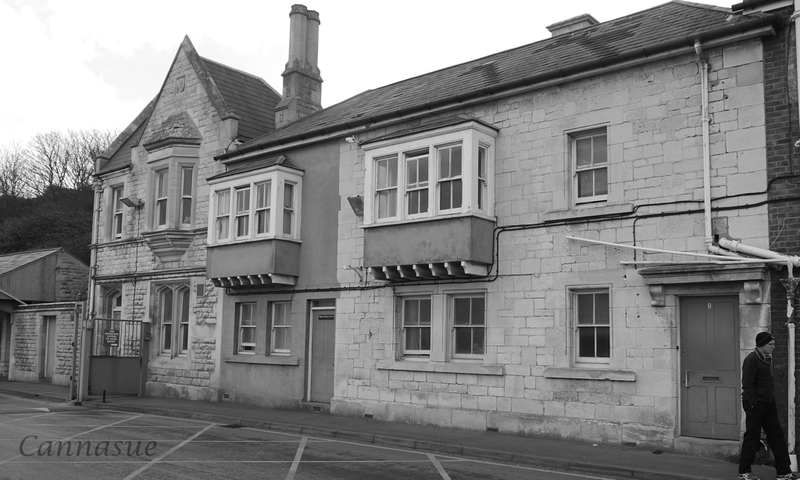 Hotels and Inns were also often venues for alternate occasions such as inquests and auctions, such was the case later in 1901 when the hotel was packed out with prospective buyers and inquisitive onlookers as a vessel, SS Dinnington, which was stranded in the Roads was auctioned off piece by piece, gigs, boilers, anchors and all. Living next door to this bustling hotel, at the house of no 15, is 26-year-old William Albert Fern, a Londoner, along with his wife Ethel. William runs the stables and works as a groom for the hotel. The young couple have a baby, William Henry Edward, who was born in Child Okeford, the same place as his mother’s boss. Presumably the families knew each other hence their move to Portland so soon after his birth, and where they had baby William christened. The house of no16 is the home of 52-year-old Elizabeth Schollar. Having lost her husband Edward in 1899, now widow, Elizabeth earns her meagre living as a laundress working from home. Edward had played a part in a tragic incident in November of 1891. Two local Castletown boatmen had been hired to take a party of eight sailors back to their vessel, HMS Howe out in the Roads, but the sea conditions were atrocious and the boat suddenly filled with water and capsized. Seven of the men were hauled from the cold waters, but it was too late for three of them, including one of the local men, 40-year-old Thomas Way. 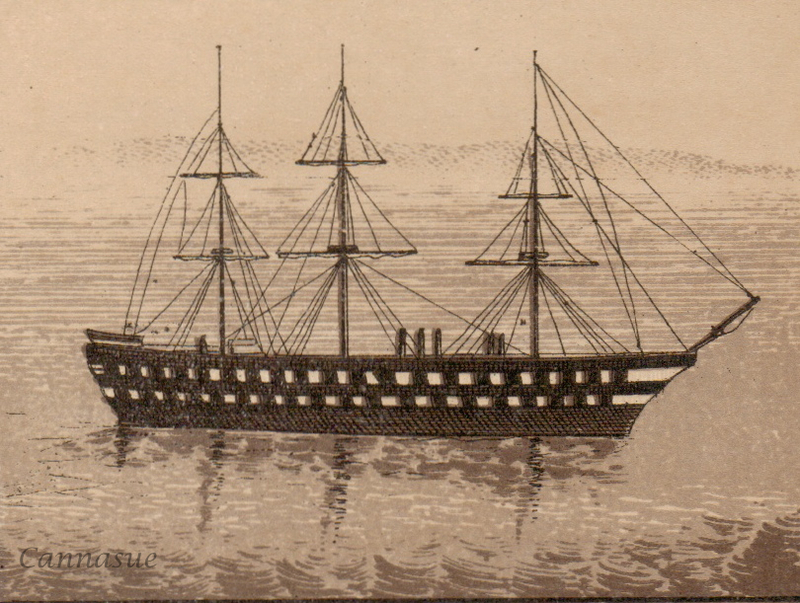 Edward later discovered one of the men’s missing bodies floating near another warship and gave his evidence at the inquest held in the Breakwater hotel. No 18 is the abode of the Wills family. 38-year-old William, Portland born and bred, a man of the sea, he’s a captain kept busy working on the steam launches that regularly plough the local waters. His wife, Mary Ann is also a local girl. They have a veritable brood living with them, John, the eldest at 15, is working as an office boy, (but by the time of the next census, 1911, the call of the sea had been too strong,) Next in the Wills line is William who is aged 10, he is listed as ‘visiting’ widow Elizabeth next door on the census form, maybe it was a bit more permanent than that? Perhaps space was tight for the growing family. Then came Robert, at 14 he was working as an errand boy, (like his brother he too, later in life, couldn’t resist Neptune’s lure.) Poor old Mary Kate was the only rose amongst a veritable bed of thorns, but at the age of 6 she could more than hold her own…she had to learn fast living with such a bevvy of brothers! Below Mary Kate comes toddler George Richard, at 2 years of age he is into everything, running his poor Mum ragged. Bringing up the rear of the male-dominated Wills family is baby Richard Everett Hutchings, (the Hutchings in honour of his paternal grandmother.) This little mite only just arrived in time for the census. Also living in 4 rooms of the shared property at no 18, is Portlander, Walter Anthony aged 37. His occupation is listed as a boat proprietor. He had always toiled with the sea, having previously been a fisherman, but the like so many others in the area, the comings and goings of the navy within the Roads provided the means of a lucrative income. His wife Harriet had moved here after their marriage, her family fare from Lyme Regis. They have a son, 10 year old Walter Samuel. Another family squeezed into just 4 rooms at no 18, is Tamson Hounsell and her assorted brood. Matriarch of the family, Tamson, aged 56, is already a widower, she supports herself and her brood by trading as a fish merchant. In happier times she had been married to Edmund Samuel Hounsell, who was a Trinity pilot, but sadly in 1879, aged just 36, Edmund died and left Tamson to raise their brood alone. But for now, she has some of her close family besides her. First listed on the census form is 23-year-old son Abraham who toils along side his Mum in the family fish business. A certain young Daisy resides within the household, described as daughter to the head, but as Daisy is only 15, she was born long after the death of Tamson’s husband. More likely Daisy is a granddaughter, a child of another son, Samuel’s perhaps? Also ensconced safely within the family bosom is one of Tamson’s daughters, Georgina who was married to George Griffin, a sergeant in the 21st Kent Regiment that had once been based at Portland’s mighty Verne Citadel. Staying at Granny’s house with Mum are 3 of Georgina’s children. 7-year-old George, 6-year-old Edward and toddler Samuel, all are testament of Georgina’s travels to far flung countries with her husbands regiment, the trio were born in India. At one stage the Kristensen family used to lodge in the building that sits virtually opposite to no 18, that was until they got their own little dwelling. 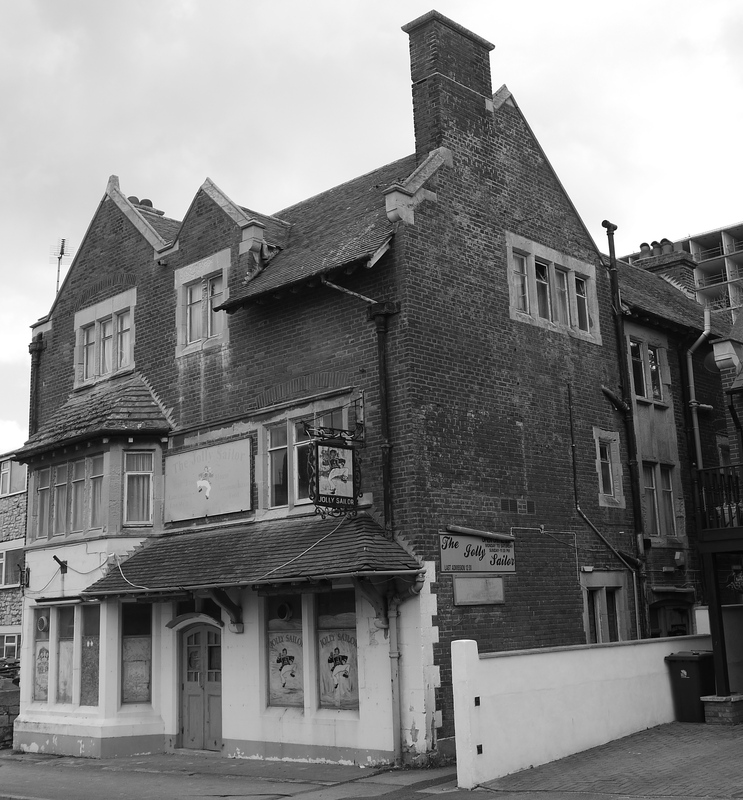 This building is the Castle Hotel, which sits at the entrance to the pier, the business is now run by recently arrived Kimberlins, Alfred Thomas Pope, 32, his wife, Ethel Alice, aged 24, and living with them is their baby daughter Olive Christina who was born while her parents lived in in Portsmouth. Working alongside the Popes is a young lad, with his strong Suffolk burr, William Sergeant keeps the punters happy, he’s the pot boy or barman. So busy is their hostelry that William’s not the only resident barman, so too is a Somerset lad, Ernest J Billett. Though Ernest had been born in Somerset, as had his siblings, his parents in fact originally came from Weymouth and Wyke Regis. Ernest’s Dad, James, worked for the railway, and is now the gate keeper for the local service, the family living in Railway Gates Cottage at Wyke Regis. The new pier was the surprise landing place for a Royal visitor in 1902, which caught the residents of Castletown completely unawares. ‘When a hue-hulled barge steamed briskly towards the new stone pier at Castletown a few minutes after 12, the dock labourers and a few children gathered at the landing. 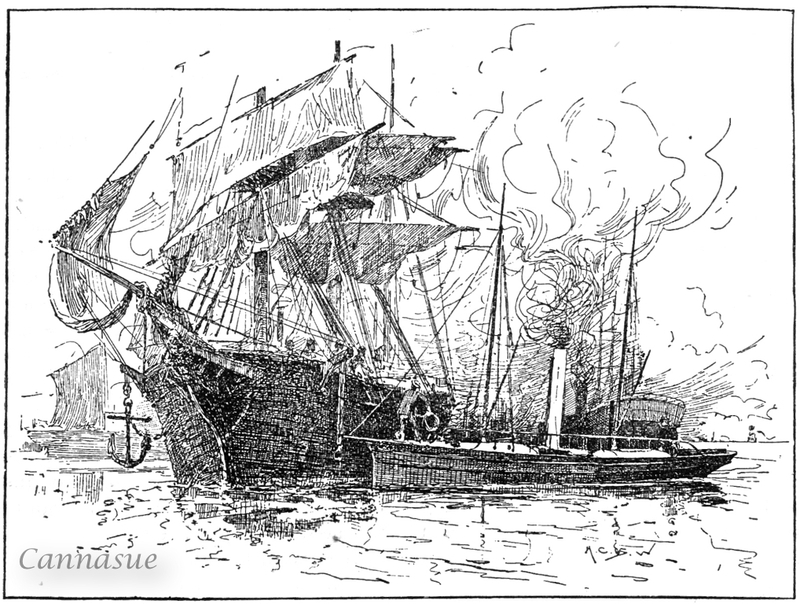 But the barge contained Colonel Davidson and another of the equerries, and the little crowd soon melted away. The quest of a Royal carriage was not at first successful. A hotel along the water was appealed to, but could not supply the required vehicle. Finally, Mr Cresswell, of the Victoria Hotel produced a landau and two horses. Royal visitors aside, we return to the everyday residents and move on to the house of No 14, this is the abode and business of old Moses Davey. At a mere 63 years of age, he is still busy suiting and booting those who visit his clothier and outfitters business, aided by his wife Mary Ann. The art of tailoring was in Moses’ blood, brought up within his family clothing business in Exeter, he knew of nothing else. By the time of the 1881 census Moses and Mary Ann had moved their extensive family to Portland where Moses worked as an outfitters assistant. 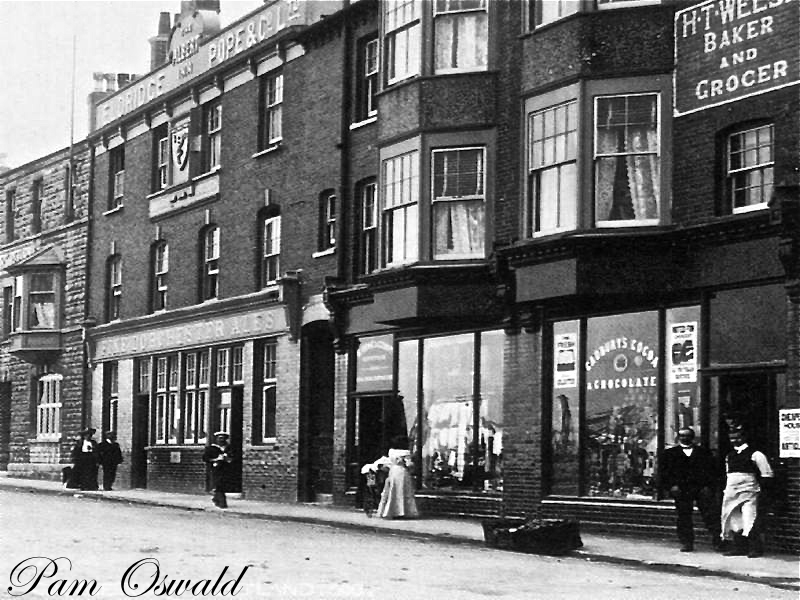 By 1891 he was managing the shop and here the family still live and work come 1901. Their last born son, Frederick John, the only child still at home, is the only one of their veritable brood to be born on Portland, but he isn’t a man of the cloth so to speak, he prefers getting his hands dirty, tinkering with mechanics and engine oil, ending up with a career as an engine fitter for the Admiralty. Yet another pub nestles within this row, the Albert Inn, run by 35-year-old Charles Stephen Monger and his trusty companion and wife, Louisa Ann, who is a Portlander from the Colston family. When Charles and Louisa married in 1890, they moved in with her parents in Castletown, at that time Charles was working as a water clerk, (or boatman…depending on which document you read!) Louisa is kept pretty busy with her brood of four children, two girls, Violet 8 and Joy 6, and two lads, Charles 2 and baby Harold. The Monger’s have only recently taken over the running of the pub, and that was mainly due to the misfortunes of another less than happily married family, the Steers who had run the hostelry since 1895. Headlines in the May of 1900 Western Gazette bellow of ‘EXTRAORDINARY CHARGE OF DESERTION.’ whereby the plight of the Steer’s unfortunate circumstances were laid bare for all to read. (Charles himself made the local papers when in 1906 he was out fishing for bass. Instead of hauling in fish he found himself with a prize winning catch, he hooked no less a specimen than a hulking great torpedo, one that had been missing for some while. 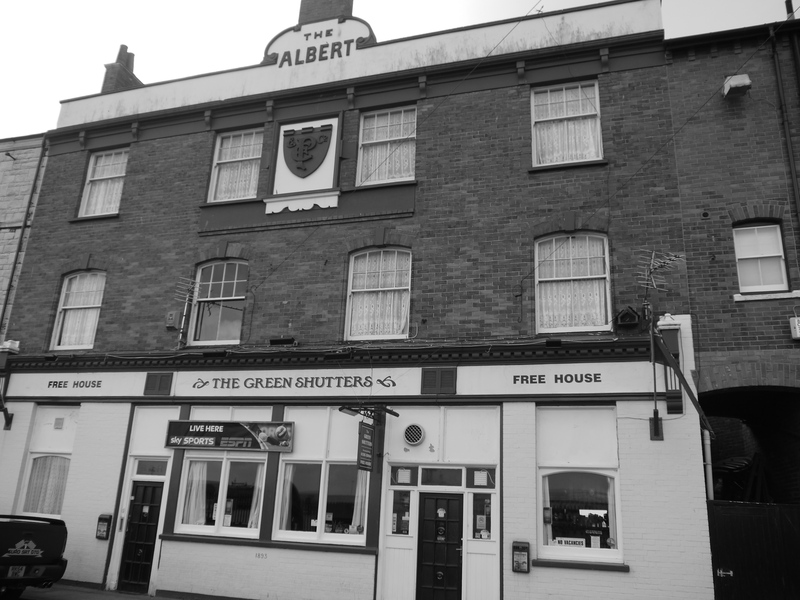 The aptly named hostelry, the Sailors Return snuggles up next to the trusty Albert. At the age of 69, widow Frances Mills is at the helm…or should that be bar counter? 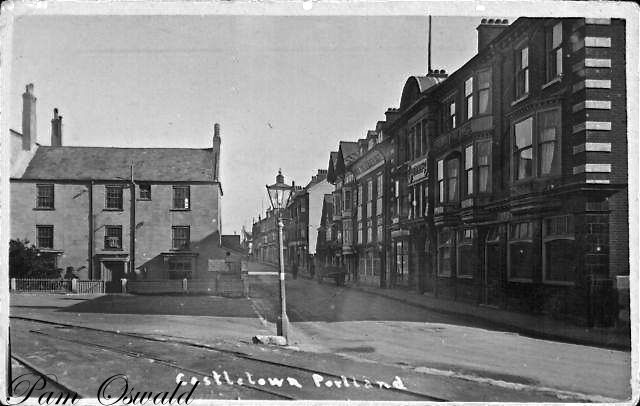 Portland born Frances, or Fanny to her family and friends, and her husband, Robert moved into these licensed premises in the 1880’s, and between working the bars, keeping many a matelot in much needed grog and providing a roof over their heads, the couple managed to produced 12 children. Sadly, husband Robert died in 1899, leaving Frances to carry on alone. Being such a close knit family, the grown children were quick to step in and help out. Living with Fanny in 1901 is her 35-year-old spinster daughter, Frances, her son Charles, along with his wife Sarah and 18-year-old grand daughter also named Sarah. Also living on the premises is another of Frances’ married daughters, Elizabeth, she and her husband, Lewis and 11-year-old Lewis junior help out where they can. Like so many of the other busy hotels and Inns along this strip, their rooms are full on census night. Another family are residing within the hotel in 1901, but rather than short stay residents, they are long term boarders renting three rooms out. Originally from Birmingham, the family have been here a while, and their youngest was born here three months prior. This is the Hiffe clan, Charles Leonard and his wife Ellen. Apart from the fact that he’s a naval man, these are are somewhat a mystery family. They have three children with them, Ellen B aged 10 who is supposed to be a niece, Charles Leonard aged 6 and last but not least, baby Alice, who at 3 months was supposedly born on Portland. The only other comprehensive sighting of any members of the family is in the 1911 census. 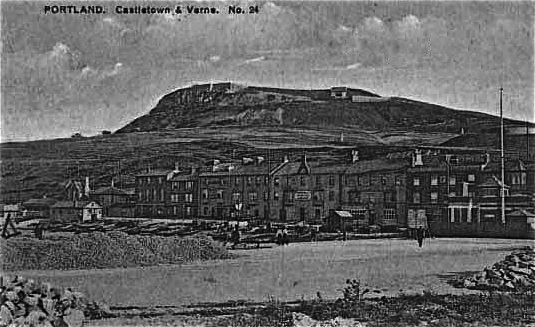 Anyway, we’ll leave the Hiffe’s to their mysteries and move on to the next family living in Castletown, the Love’s. Dad and Mum, Samuel Cole Love and wife Ellen are both in their 50’s. Living with them are eight of their children and Ellen’s unmarried sister, Frances. Samuel Love is a Devon man, Dartmouth in fact, where he was brought up in a fairly wealthy family, his father Joseph, trading in ships. However, for now Samuel works on dry land, he’s gone down the numbers route, working as an accountant. The next premises belong to the Post Office, first opened in 1868. At no 8 lives the Jarman family, Thomas and Elizabeth and their two sons Thomas and Alfred Richard. Thomas senior works as a Post Office clerk while Thomas junior, aged 15, is working as a pupil teacher in a local school. 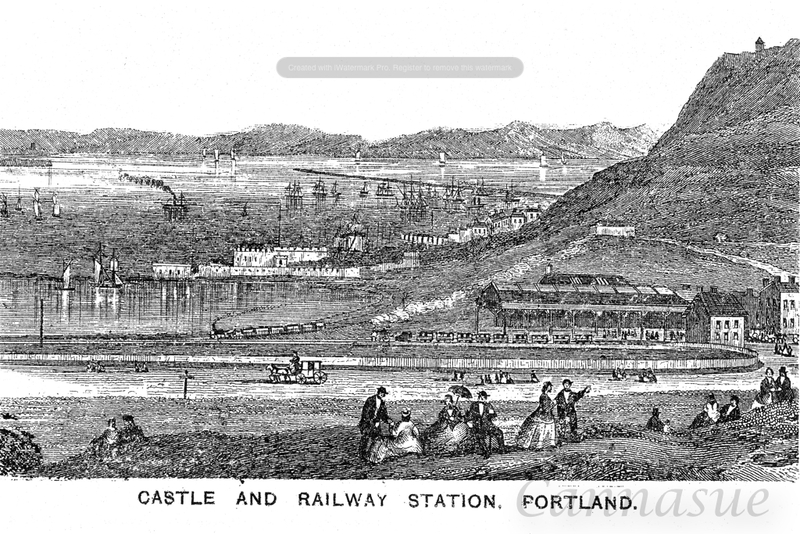 Dad Thomas had moved to Portland by the age of 10, his father, Richard, was a naval man and had found himself in a steady position working on HMS Boscowen in Portland Roads, at which point he moved his family to Portland. 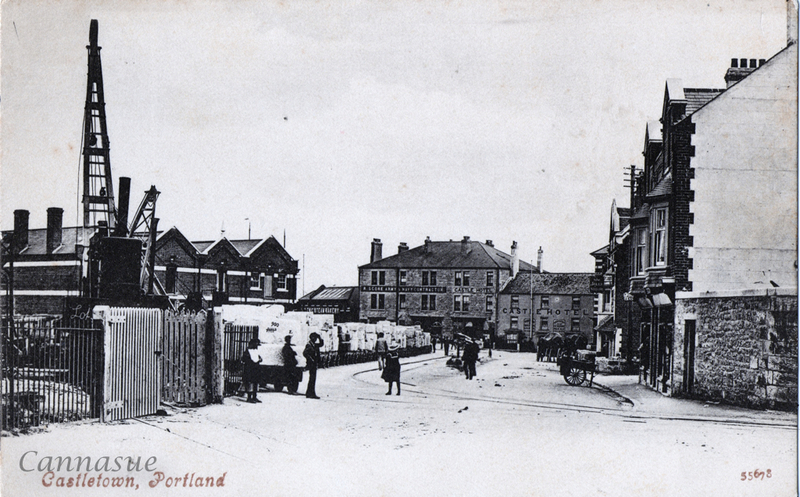 The main Post Office premises are at no 7, owned and run by Portlander 34-year-old Richard Thomas Cox along with his wife Ellen, also known as Nellie, they have three lively boys, Richard, George and Reginald. The couple took over the running of the Post Office from Richard’s parents, Richard and Emma. Before this they lived next door and Richard junior was working as a ships broker assistant because not only do they run the bustling Post Office but also they act as ship brokers and chandlers. Come 1909 and Richard Cox finds himself in trouble and on the wrong side of the law. One of his fleet of vessels was sailing off Beachy Head in dense fog when it accidentally collided with a coastal barge and sank it. The newly widowed (and newly married ) wife was suing him under the Workmen’s Compensation Act for the loss of her husband. The price put on his life? £163.00! 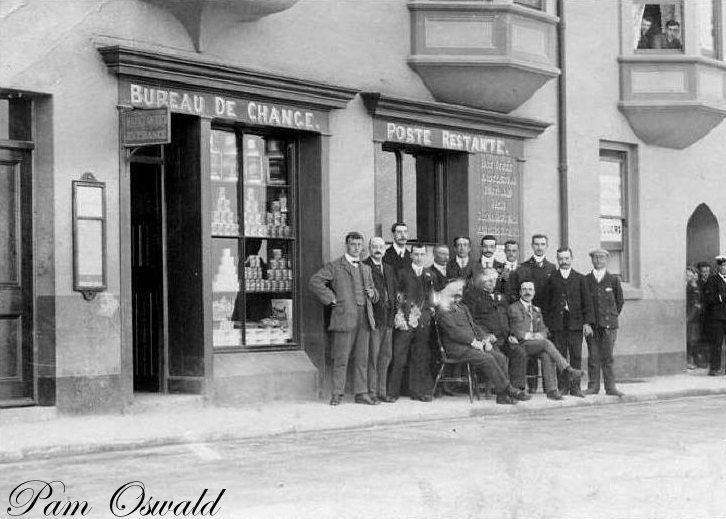 The Cox’s are still running their businesses at the Post Office in 1911. Next in line in the terrace is no 6, the is the home of newly arrived Albert and Charity Lewis, Albert is foreman of the breakwater works. Previous to their move to Portland the family had been living and working in Wales, the sons worked down the pits, as coal miners, but Dad, despite the 1891 census listing him purely as a ‘miner’ was already someone in authority. This was a step up into the light for them. away from the constant dirt and the grime of the black stuff. Only three of their children are at home now, their 27-year-old daughter Lizzie, and two of their sons, Herbert and Percy. No 5 is the abode of German born 45-year-old boatman, Henry Schutte and his wife Julia. They have 2 children living with them, with a big age gap between them, 17-year-old John is out working hard as a grocery assistant while his 2-year-old sister Anita gets to stay at home and play with Mummy. To help make ends meet they also have a young couple boarding with them, Harry and Marie Bartlett. As we near the end of this road, we’re getting closer to the entry of the dockyard gates and here we come across the more officious buildings. This is where we find the people housed whose job it is to protect the comings and goings of the dockyard and Portland Roads. Two single men are listed in the Harbour Masters office, both are men of the Royal Navy, Henry Rabbits and George Lewis Baldwin. The next building along is that of H M Customs, the dreaded Preventative officers, feared by those whose maybe don’t toe the line as much as they should. In charge of the men is 39-year-old William J Daniels, a Preventative officer for H M Government. William is from a line of Preventative officers, his father Daniel was a coastguard, protecting our seas and shores from foe and smugglers is in his blood. Also in the Customs building is 29-year-old Harry Valentine Bingham, a man of Kent. 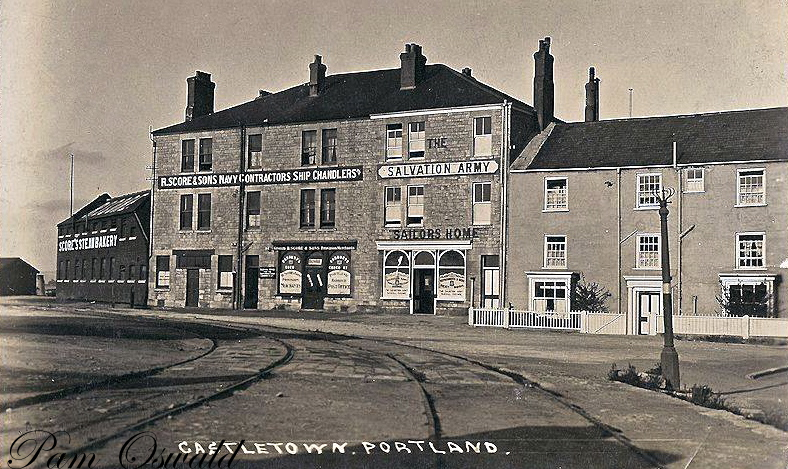 Whilst working in the area he had fallen in love with local girl, Ada Maxted and the couple married at St Johns church, Portland on the 8th July 1896. 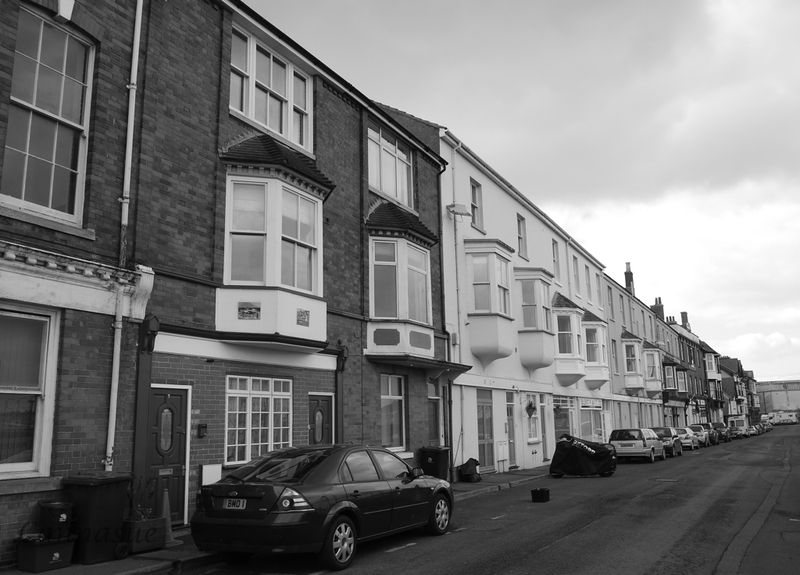 Come the night of the 1901 census, midnight Sunday 31st March, Harry is at his post in the Customs house, while his wife Ada lives with her parents still in Belgrave Place on Portland. So near yet so far. Edwin Anthony described as a ‘watcher’ is the third man listed as occupying the Customs Office. He is a Portlander aged 30, brought up in Castletown, his Dad George was a barge waterman. Edwin is also married but away from his wife Hannah Lavinia, the couple have a house in Mallams. They too were married at their local church, St John’s, on the 25 June 1893. The final man in the Customs line-up is ‘boatman’ Charlie Gardner originally from Witham, Essex. Well, I hope you enjoyed our little stroll through place and time. Sadly Castletown is no longer a bustling through fare, full of marauding matelots and mariners. 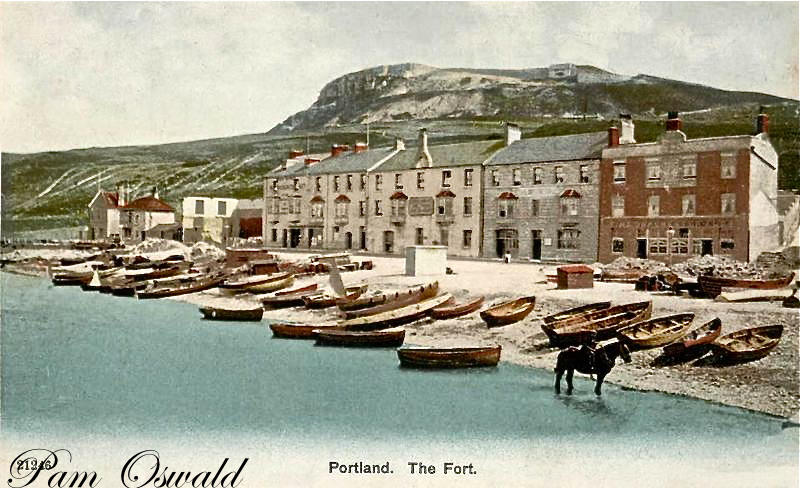 The Royal Navy pulled out of Portland, the sheltered Roads that was once the home of the might of the British navy now harbours little more than yachts, aquatic sportsmen and the occasional cruise liner that sails in to discharge its multinational passengers onto Portland shores. One by one the little shops and refreshment rooms closed until it’s little more than a residential street. Maybe though, there’ll be a new chapter in it’s life. A very big thank you to Pam Oswald who so kindly let me use the pictures from her personal collection. If you enjoy a bit of good old tittle tattle about the lives of Weymouth and Portland residents past, why not search out a copy of Nothe Fort and Beyond. Hi Sue, very much enjoyed reading this tale, particularly as I am related to the Georges that ran the Royal Breakwater! Would you happen to have any photos of the hotel from around that time? Glad you enjoyed it. I’m afraid that I don’t have any more photos of this area, most of the old pictures on this post were loaned to me by another local lady. If you squint hard enough you can just about see the frontage of the Breakwater in a couple of them. I did try a Google search for more illustrations. Might be worth checking out Geoff Kirby’s website about Portland, see if he has anything on there. Hi Sue, really enjoyed reading this, my Grandfather was the landlord of the Royal Breakwater from early late 60`s to mid 80`s and I grew up in the hotel and had my childhood in Castletown, Your description of the busy Navy Days and the Pubs on the strip[haven`t used that word in 30 years] brought back some memories, so thank you for your work. I love it when I hear from people who lived in these areas or knew the history of the families, I think we all need our memories jogged from time to time…I know I certainly do. Through my mother I’m related to the Portland “Males”. Arthur Male Senior 1821-1900 lived 79 years and had ten children. He was both Master Mariner and Publican (Jolly Sailor). He fished (mackerel) and piloted mostly with the boats “Essay” and “Margaret and Sarah”. Most crewed by his sons Arthur Junior, Abraham and Stephen Sometimes with Samuel Hounsell, related to the boat builder Alfred Thomas Hounsell? With family and boarders there were up to eleven people living at the Jolly Sailor I wonder how they kept clean, fed and slept in such a small building, it was obviously done. What happened to the families in this era when the breadwinner dies – workhouse? Thank you for the kind comments. I love it when people get in touch who have ancestors mentioned in my tales. I think that often families worked closer together in those days, supporting one another, rather than being spread out over the country as is often the case nowadays. Though saying that, the Victorians moved around far more than most people suspect, especially when they saw a lucrative business prospect on the horizon. This was such a great read! My research into my Monger ancestors brought me here. Charles Stephen Monger and Louisa Ann Colston were my twice-great grandparents. I have often wondered whether the couple walking hand-in-hand in that street scene including the Albert Inn were my great-greats! I’ve also wondered what the story was behind Charles’s unusual place of death. Louisa apparently died in the London Hotel, Upper Bond St., Weymouth in February 1943. I believe one of their sons, Leslie, died in a motorcycle accident at age 27, although from memory I think this info came via oral testimony, so I can’t be sure. I didn’t know that story about Charles and the prize-winning catch. Is that article accessible online? I am the great-granddaughter of Charles and Louisa’s second eldest child, Ivy Victoria Monger, who is recorded as “Joy” in the post above. Ivy ended up marrying an Australian World War 1 soldier and coming to Australia and had three daughters. This is her profile on Find-a-Grave, https://www.findagrave.com/memorial/152753733/ivy-victoria-brown. Ivy’s profile on Find-A-Grave has a photo of her but the info on there is not entirely accurate at the time I am writing this comment; I have just submitted some suggested edits to the person managing her profile and I am in the process of trying to link her second daughter’s profile to her own. (Sadly, Ivy’s second daughter Joyce Colston Brown died of rheumatic fever, age 15). Hi Michaela, thanks for getting in touch. I love it when a relative contacts me with further information on their families. When I write my pieces I often wonder what became of these people in their later lives, so it’s great to find out, even better to see actual photos of them. The article about the prize winning catch would have been in one of the old newspapers I spend hours (or should that be wasting time?) browsing through. When I get chance I’ll find it and pop the link on here for you. Sue.